The Cathedral at Worcester more properly known as The Cathedral Church of Christ and the Blessed Mary the Virgin of Worcester. The Cathedral has been described as the most architecturally interesting and one of the most pleasingly located of all English Cathedrals especially when viewed from the river. The building represents every style of English architecture from Norman to Perpendicular Gothic. The term cathedral comes from French cathédrale from Latin cathedra, "seat" from the Greek kathedra (καθέδρα) seat, bench, from kata "down" + hedra seat, base, chair. 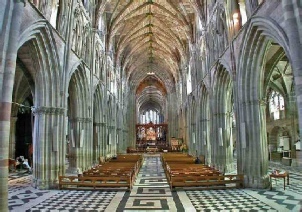 Hence it is a Christian church which holds the seat of a Bishop, in this case the seat of The Right Reverend Lord Bishop of Worcester. 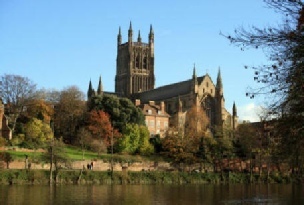 The See of Worcester was founded in 680 AD by the Benedictine monks of Whitby when Bosel was consecrated as the first Bishop. The first Cathedral being dedicated to Saint Peter. Some three hundred years later a Benedictine monastery was founded by Oswald on the site with a monastery church, or minster, dedicated to Saint Mary which replaced the earlier church of St. Peter. In 1084 Bishop Wulfstan commenced the present building beginning with the crypt. Building and rebuilding work continued until 1432. Between 1640 and 1660 considerable damage was done to the building by Parliamentarian forces. Much restoration work was undertaken by the Victorians between 1857-1877 and work on the Cathedral, started in 1988, is still ongoing. King John, a devotee of St. Wulfstan, was buried in the Cathedral in 1216 and Prince Arthur, the eldest son of Henry VII and heir to the Tudor throne, was buried in the Choir in 1502.